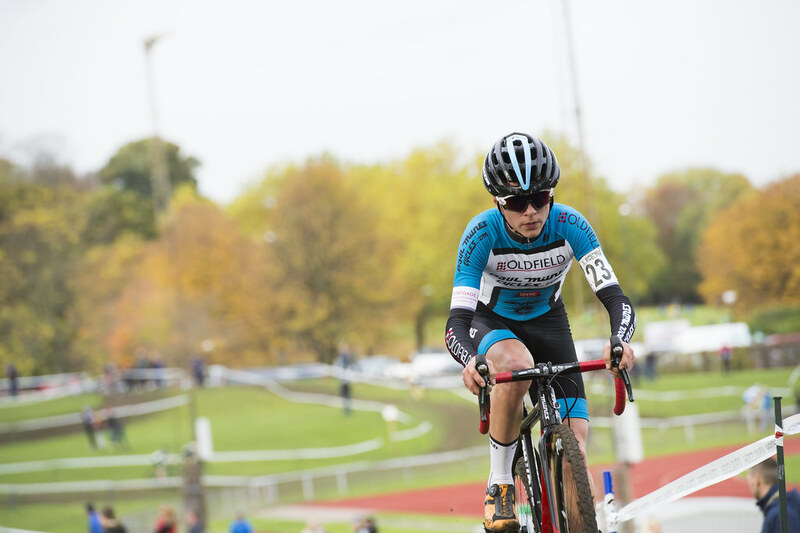 Winners at Southampton two weeks ago, Ian Field (Hargroves Cycles-Ridley RT) and Hannah Payton (Team Kinesis) repeated the dose with an elite race double at the second round of the British Cycling National Trophy Cyclo-Cross Series at Moorways Leisure Centre, Derby. Field took it steady on the opening lap, Graham Briggs (JLT Condor) taking the early initiative and leading out Beeline’s Ben Sumner, Angelo de Clerq (Sunweb-Napolean) and a long line of others around the sweeping course. With the race getting into its stride, it would be a select group that would dictate proceedings. De Clerq, Sumner, Steve Roach (Raleigh-GAC), Nick Barnes (Hargroves), the Hope Factory trio of Paul Oldham, Jack Clarkson, Dan Booth and Nick Craig (Scott Racing) along with Briggs and Field were by the second lap making a decent gap to the rest. With the race heading towards the woods for the second time it was Field who made his move, powering towards the front of the group. De Clerq was able to respond and the Belgian hooked onto Field’s wheel, the pair riding away and getting a quick split of some 15 seconds. The remainder of the original group tried to respond but couldn’t close the gap on a course that favoured a lone rider. As the mid race laps ticked by the head of the chase group would change, each rider doing their turn to try and bring the now increasing gap back to the leaders. With the lap board showing five to go, the lead two upped the pace. Oldham put in a strong attack which split the chasing group, Roach was caught out and lost touch slightly, but would recover on the following few laps. Briggs, still retaining his late season road form, was able to respond and was soon up to the Hope rider. Oldham’s attack had split the chasers for a while but they regrouped, Giles Drake (Leisure Lakes) and David Fletcher (Pines Cycles-Felt) had both worked through the race and were up towards the sharp end with the chasers. With three laps remaining Field dropped De Clerq and the Belgian dropped back to the chasers, and the leader was now riding his own lines and - barring any incidents - looked favourite to take the win. The penultimate lap saw a big attack from Roach going into the woods, but the chasers neutralised the effort and it would be on the final lap that saw De Clerq and Briggs go on the attack. Roach and Oldham kept the pair within sight and as Field took the chequered flag the race was going off on the final drop to the finish straight. De Clerq had the gap to take second but it was Briggs, Roach and Oldham who would have to sprint for the placings, Briggs just having the legs to take Roach for third while Oldham had to be content with fifth. “It was nice to have De Clercq there early on and have someone to race,” said Field, the reigning national champion. “But it’s easier round here to ride on your own rather than squabbling in a group, so I was quite glad when it went early and I could ride my own pace, get the effort out where I wanted too and take it easy where I wanted to, because it was quite slippy in places. 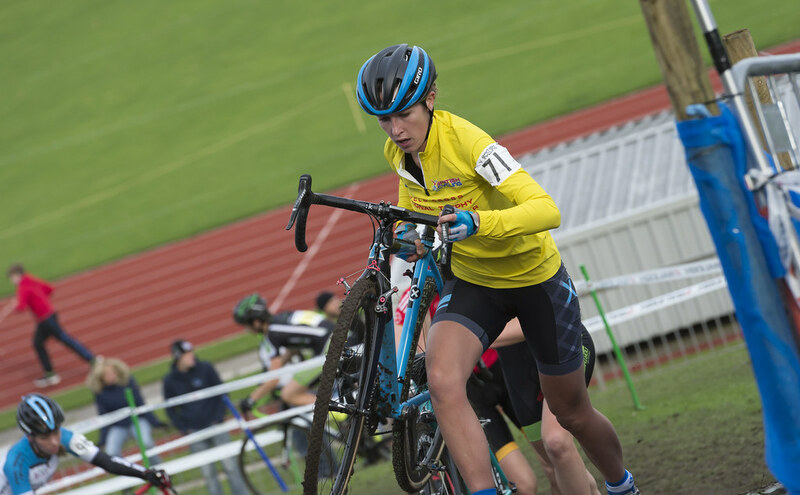 Hannah Payton added to her first round victory at Southampton with a fine win at Derby’s Moorways Leisure Centre, putting the Team Kenesis UK rider into a strong lead going into round three of the series at Durham in two weeks. Charlotte Broughton (Corley -Drops RT) had a flying start in the race, flicking across the front of the field on the fast opening straight to take the race into the first corner. Beth Crumpton (North West CC), Amira Mellor (Oldfield/Paul Milnes), Maddie Gammons (Sherwood Pines SRAM), Diane Lee (Mulebar Girls), Annie Simpson (Hope Factory Racing) and Ffyon James (Abergavenny RC) all made strong starts too and formed an early break. Payton was in close contact and as the race went past the swimming pool on the opening lap she took the head of the race. James, Mellor and Simpson went on the chase, while Broughton, Gammons and Lee consolidated and though there was a gap they looked to be comfortable with the chase. With around 15 minutes gone Payton was increasing the gap. Mellor chased but to no avail, although she kept a gap over Crumpton and James who had earlier attacked. Payton was making easy work of the slippy conditions, alone on the front and able to choose her own line. But it was proving ever harder for the chasers to bring her back. Crumpton had worked over James and was up with Mellor, Simpson and Lee, the quartet being a handful of seconds behind with Gammons and Adela Carter still in contact. But as the final few laps ticked by Payton eased off slightly, not taking any chances and just keeping a safe gap to Mellor. The Kinesis rider crossed the line around 20 seconds to the good of Mellor. Crumpton continued a good block of rides to take the final step of the podium. “It was a dominant performance once I had got round the first lap, but I didn’t have a particularly good start,” said Payton. “There were a lot of riders on the front row who are strong sprinters, so the starting straight was a bit of a mess for me and I didn’t get into the corner in the position I wanted to. “As soon as we got into the woods it was single track and hard to follow lines fast, so for the first half lap I wasn’t particularly comfortable, but once I got past and had the space to put the power down it went OK.
“It’s a super-quick start straight with the tarmac and is flat out for 200 metres. I knew that I would settle in. I was conscious that Beth was leading it, so I didn’t want to get stuck in seventh or eighth. Tom Pidcock (Oldfield/Paul Milnes) took victory in the junior race, riding team mate Ben Turner into second with a brilliant display of both bike handling and power. With the winner of the opening round Dan Tulett not taking the start line, it was Pidcock who took the early initiative, attacking on the opening lap to get the gap on the rest of the field, a gap which only Turner get any sight of. Harry Yates (Hargroves Cycles-Ridley) dug deep to try and bridge the gap in the opening laps but along with Mark Donovan (Beacon Wheelers), Cameron Orr (Sherwood Pines SRAM) and Nottingham Clarion’s Callum Fernie had to be content to fight it out for the last step of the podium. Pidcock was unstoppable throughout and Turner just didn’t have the legs to make the gap to his team mate, such was Pidcock’s race he took first place overall. Fernie ran out third place taking a three-man sprint between Yates and Orr. Rob Jebb (Hope Factory Racing) proved to be too quick for series leader Darren Atkins (Ride Coventry) in the over-40s race. Jebb took his first veterans start line and carried his recent good form into the quick Derby course. Jim Bryan (Zepnat) took an early lead with Atkins, Jebb, Kris Lapere (Annequin CT), Dan Guest (Performance Cycles), Andy Parry (Urban- Cyclery) and Andy Taylor (C&N Cycles RT) chasing down. But Bryan couldn’t hold the lead and both Jebb and Atkins took to the front on the second lap distancing Bryan into the third. The chase group were still a few seconds back with Bryan able to hold on to third. Jebb would begin to pull away from Atkins and with two laps remaining was on the front, while Atkins dug hard to pull the Hope rider back. Lapere had worked up to Bryan and approaching the hurdles for the penultimate time got the better of the former National Champion and moved into third. But Bryan retook third as the bell rung for the last lap, while Lapere was unable to respond. Jebb crossed the line to take a solo victory from Atkins who retains the Series yellow jersey. Pedalsport CC’s Chris Young took his second victory in the over 50s series, once again getting the better of the current national champion Tim Gould to claim a lone victory. Young and Gould both jumped away early in the race and before the end of the first lap were working through the back of the over-40s field. Grant Johnson (Sunset Cycles) was the only rider within sight of the lead two for most of the race, but Team Jewson’s Phil Roach worked well to haul Johnson back and take third spot on the podium. Nottingham Clarion’s Poppy Wildman was once again dominant in the under-16 girls race, Wildman taking her second win of the series. She took an early lead and only really looked back on the final lap as she eased off slightly. Harriet Harndon (Malvern Cycle Sport) took second and Elspeth Grace (Welwyn Wheelers) third after outsprinting Olivia Fawcett and Xan Crees. It was a family and club 1-2 in the under-14 girls race with Anna and Maddie Wadsworth taking the top two places on the podium for Beeline Bikes RT. Anna jumped away early in the race and kept the lead to the chequered flag and took the series lead for her efforts. Maddie held off Towy Riders’ Eluned King into third while Ava Oxley-Szilagyi had to surrender the white jersey after finishing fourth. It was all change on the podium in the under-16 boys race. After third at the previous round, Ben Tulett (Beeline Bikes RT) made no mistake to take the win from the Lichfield pairing of Lewis Askey and Toby Barnes. The three took the lead on the opening lap, a lead that would increase lap by lap to the rest of the big field who were unable to get across to the them. Tulett made his move at about half distance and though the gap came down slightly on the last lap the win was his for the taking. Askey held off a final surge from Barnes to take second. Leicestershire RC’s Alec Gregory took his first National Trophy win in the under-14 boys race. Oliver Stockwell (Welwyn Wheelers) went one place better than the first round with second place and Matti Egglestone took third. Maddie Smith (Bolsover & District CC) retained the green leader’s jersey in the veteran women’s race after her second and decisive win in the series. Team Jewson-MI Racing’s Martine Verweij took second and her first series podium and Helen Pattinson (Solent Pirates) took third. “All these lads are flying, I didn’t know how it would go because I started on the fifth or sixth row, but I got through alright and really enjoyed it,” said 40-year-old Jebb, from Kendal in Cumbria.